If you've ever encountered a body of water populated with lily pads, you've likely been amazed at how these unusual aquatic plants seem to float on top of the water. 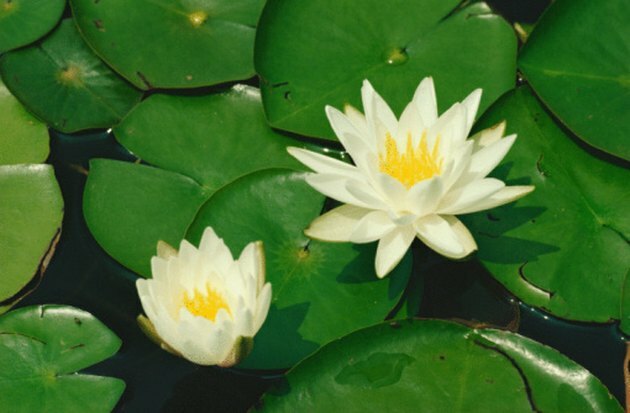 Lily pads are just one part of a larger pond plant that thrives in shallow lakes and ponds. There are about 70 different species of this aquatic flowering plant, found in both temperate and tropical zones. A lily pad is the leaf of the water lily plant. Although these plants appear to be floating with ease, there is actually a lot going on beneath the placid surface. Even some of the most common facts about lily pads are quite surprising. The underside of a lily pad looks vastly different than the top. A system of stems and tubes run underneath the lily pad. These tubes, which are connected to openings called stomas in the top of the leaves, help the pad float and collect oxygen through the stoma. This oxygen is transferred to the water lily's stem and down to the plant's roots. Up to two liters of air a day are sent from the top of the lily to its roots through this mechanism. The bottoms of lily pads may also be a dark purple color in sharp contrast to the green tip surface—this dark coloration helps the leaves absorb the sunlight required for photosynthesis. Water lilies reproduce both by way of seeds and by the spreading of their tenacious roots, or rhizomes. Though lily pads spread relatively slowly, they can eventually take over entire shorelines and are considered invasive in some areas. Water lilies and their surface lily pads can blanket areas of water as deep as six feet. A single rhizome can reproduce and grow to cover an area 15 feet in diameter in as little as 15 years. When spread to non-native habitats, water lilies can shade the water and make it too cold for native species of fish and plants. Water lilies may also compete with native plants for nutrients. 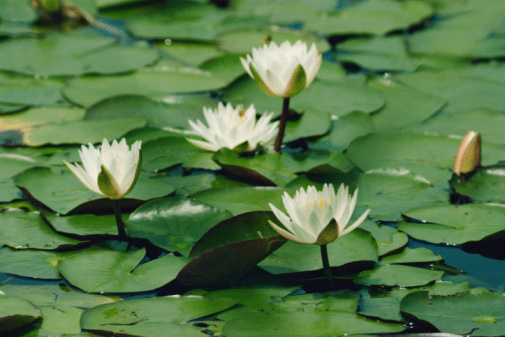 While invasive in some areas, water lilies are native and beneficial in other areas. Water lilies grow in the calm shoreline waters of lakes and ponds. In moderate quantities, these plants greatly benefit their habitats by providing shelter for fish and shade to keep the water cool. Water lilies provide safe spaces for frogs to perch on their leaves, hiding from underwater predators. Lilies also produce natural oxygen that allows fish to breathe and beneficial bacteria to thrive. In areas where water lilies are native, native American tribes commonly used different parts of the plant to treat a variety of ailments. When mashed, the roots created a poultice that reduced swelling. These poultices were also used to treat reproductive problems in women, and also as a mouth rinse. The surface leaves—the lily pads—were used to ake cooling compresses. Because they are such beautiful plants, it's no surprise that water lilies have seen widespread use as ornamental plants in cultivated water gardens. Particularly popular is the Mexican water lily, which is native to the North American gulf coast. This species has been planted throughout North American, and where it escapes cultivations it can become invasive. 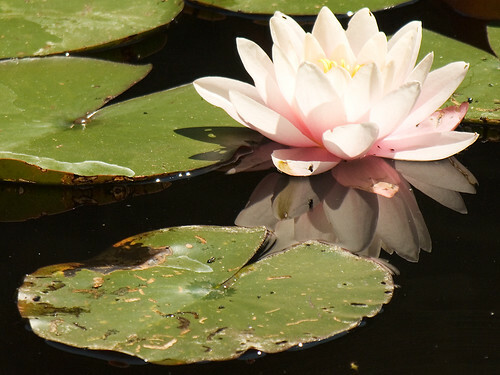 To get the benefits of water lilies without spreading them to unwanted areas, contain them within an enclosed backyard pond or water feature and keep them well away from natural waterways. Melissa Lewis has worked as a freelance writer since 2004, gaining much of her experience by working in the marketing/PR field. She writes for various websites, specializing in the areas of marketing, home improvement, cooking and pets. Lewis studied English at the University of Wisconsin-Madison. What Makes Water Lilies Float?